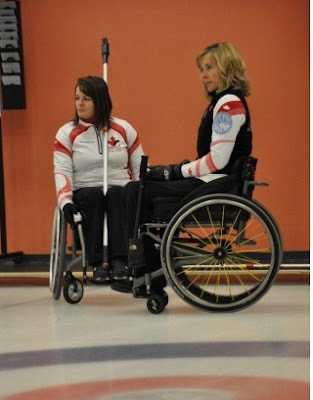 For Sonja Gaudet the 2011 World Championships in Prague were her sixth consecutive year on a world stage and her fourth gold medal. "Obviously we couldn't be happier about the result," Canada's lead told me. 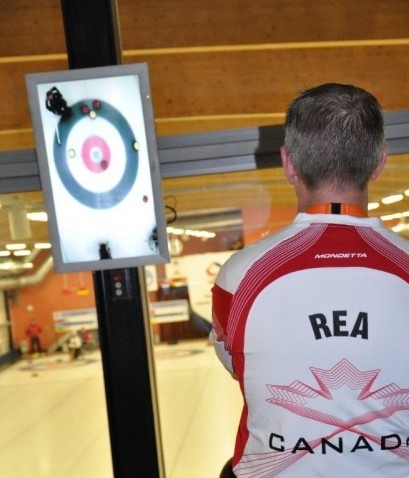 "Everything was very well organised, and the Prague (Curling Hall Roztyly) curling rink is a very accessible and friendly place. The ice conditions and the rocks were great - as was the accomodation, food and transportation. So with all these details taken care of and once the jet lag was managed, we only needed to concentrate on our performance and that makes all the difference in the world." Darryl Neighbour agreed with Sonja that the facility in Prague was excellent. "They put up a heated tent to accommodate all the wheelchairs at mealtimes," he said, "and though the temperatures dropped to below freezing outside, it didn't snow. The hotel was just a few minutes away and there was no messing about. 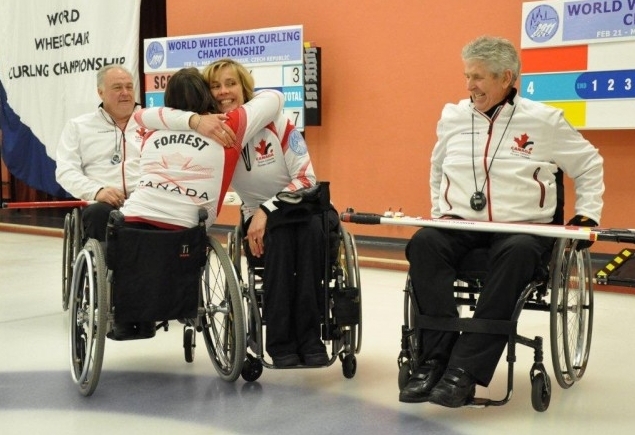 We had our own van, five wheelchairs inside and it was hold onto each other and we're off." Team 5th Bruno Yizek had more of a spectator's view of the facility and was also impressed. "I spent the majority of the time watching the games," he said, "and the facility had great viewing from the upstairs lounge. Also each sheet had a big flat screen to see the houses. Both houses could be seen by a push of a button. At the end of the day's matches I had the opportunity to go on the ice and practice for 15 minutes. This gave me a feel for the ice and rock conditions, so I would not go into a game cold when called to play. The ice was super and (everything) was very well organised." Darryl acknowledged that Canada's first game against China was a wake-up call. "We were lucky to steal that win, and I think it woke us all up." Jim Armstrong agreed. "Our toughest game was China, for two reasons: first game with the rocks and ice, and secondly, we got down 3 early, and they can hit with big weight." But the difference for Canada was the play of Sonja and front end teammate Ina Forrest, according to Armstrong. "They were just simply better than any other front end last week, and not by just a little bit In my opinion they both had a series that truly has reset the bar in our sport for front ends." Both Jim and Darryl Neighbour mentioned how much easier it was to play their positions when the ends were being set up so well for them. 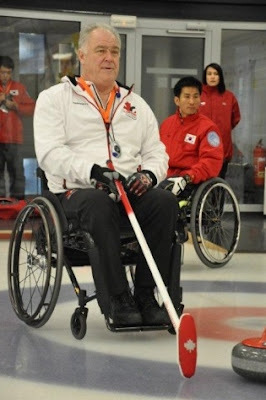 "We took advantage of the teams whose front end players were not as strong," said Darryl, who though 62 is still looking to be defending his Paralympics title in Sochi, Russia in 2014. "It is a big commitment," he told me, "and the travel can be tiring. But I am in the fortunate position of being able to dedicate the time, and I still love the game and love playing." What was the surprise of the week? "The play of Scotland," said Armstrong. "Aileen (Nielson) looked considerably more comfortable skipping this year." Darryl also felt that China, Korea and Russia were teams to watch, especially as they gain the experience needed to call a competitive game. "Some teams hit every Canada rock they could see, regardless of the game situation or the scoreline," he said. "We have such an advantage with Jim's experience calling games." Jim saw Prague as more of a re-build year for many teams. "Our big advantage was experience throughout our team, and particularly compared to some of the teams on "rebuild." Darryl had a great week as well (as Sonja and Ina). Where it showed to me, was that I was never left with a "circus shot" for a save. When the entire team is playing well, there is no need to gamble, and the game simplifies itself. Then the trick is to keep it simple." "All the major players (Norway, Scotland, China, Korea, in particular) have a great future," Jim continued. "They have intensity, generally good technique, and are only lacking experience, which, of course, takes time. "Generally, what I saw as a whole, was a very healthy sport with a future that continues to get brighter." Ina Forrest made a point that had not been noted before: "I think it is a credit to all female curlers to note that three out of the four top teams, Canada, Scotland and Russia, had two females and two males on the ice in the Bronze and Gold medal games. She added: "Having not seen the Russian team for several years it was great to see them do so well in Worlds. Given they are the hosts for 2014, I expect they will continue to improve and be a strong contender at Paralympics. Sonja concluded: "It is always a great opportunity to re-connect with athletes and friends from all over the world that we have competed against in the past - and wonderful to see many new faces and entirely new teams." 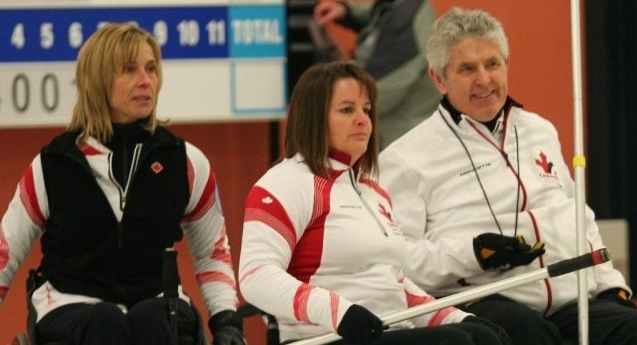 And that is a statement in the true spirit of curling.